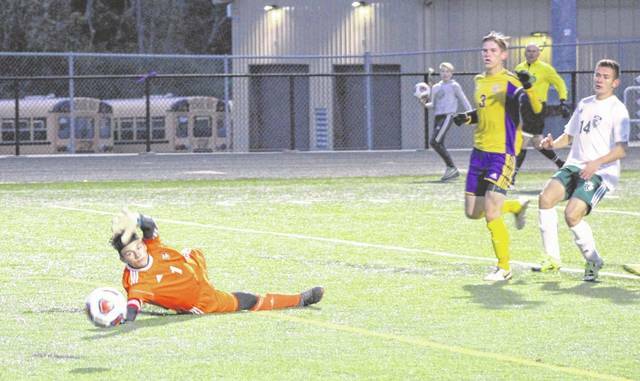 Greenville goalkeeper Jacob Maher dives to knock a Bellbrook shot away from the goal on Monday night in a Division II sectional contest. Bellbrook won the game, 6-0. Greenville’s Dylan Snyder (10) takes a head shot against Bellbrook on Monday night in a Division II sectional contest. Bellbrook won the game, 6-0. Greenville’s Kale Conway (12) plays defense against Bellbrook on Monday night in a Division II sectional contest. Bellbrook won the game, 6-0. 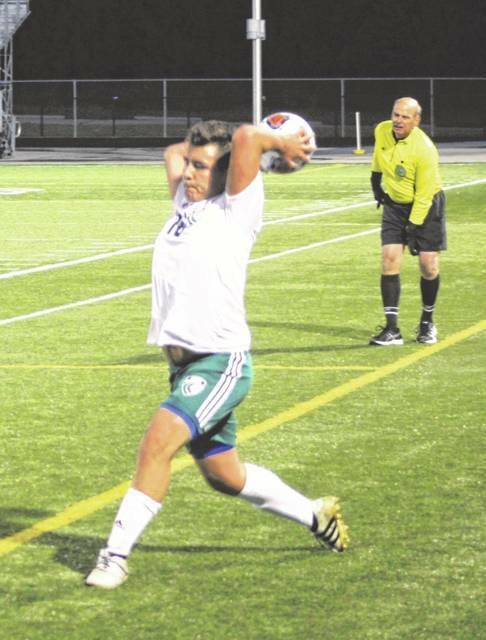 Greenville’s Pablo Badell (18) makes a throw in against Bellbrook on Monday night in a Division II sectional contest. Bellbrook won the game, 6-0. Greenville’s Sam Bankson (4) sends a pass toward a teammate against Bellbrook on Monday night in a Division II sectional contest. Bellbrook won the game, 6-0. Greenville’s Xavier Maitlen (7) battles for control of the ball against a Bellbrook player on Monday night in a Division II sectional contest. Bellbrook won the game, 6-0. 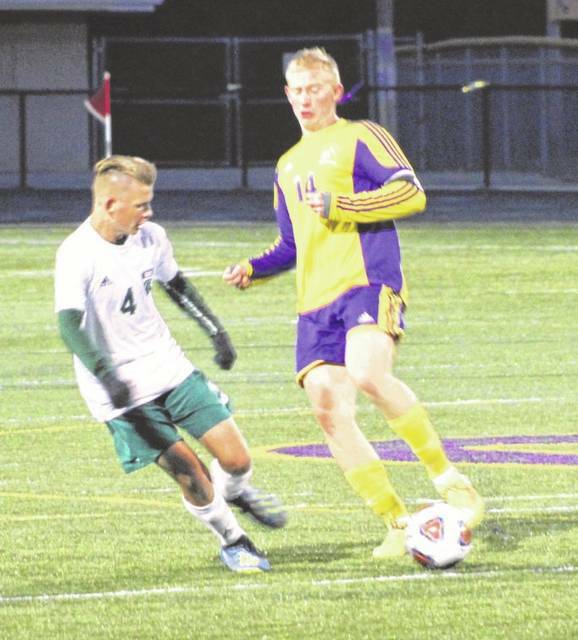 BELLBROOK – For the first 30 minutes, Greenville went toe-to-toe with third-seeded Bellbrook in a Division II boys soccer sectional matchup. 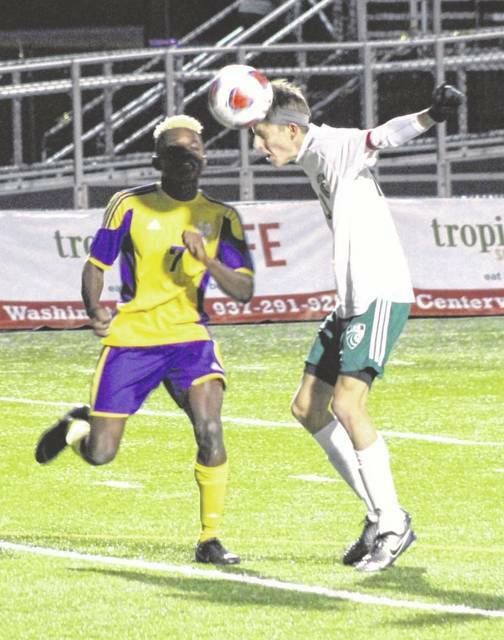 But when the Golden Eagles Bryce Ferrin found the back of the net at the 10:16 mark of the first half, the floodgates opened as the home team cruised to a 6-0 win to advance in the tournament while the Green Wave’s season came to an end. 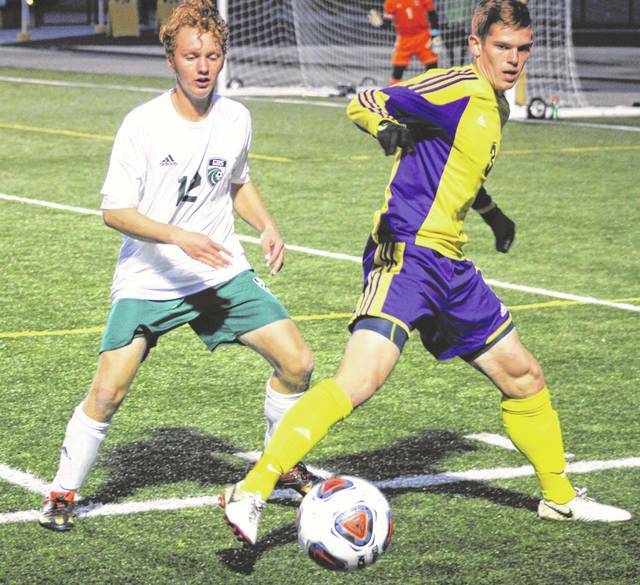 It was less than a minute after Ferrin’s goal that the Golden Eagles scored again. This time, it was Enzo Machado at the 9:57 mark. 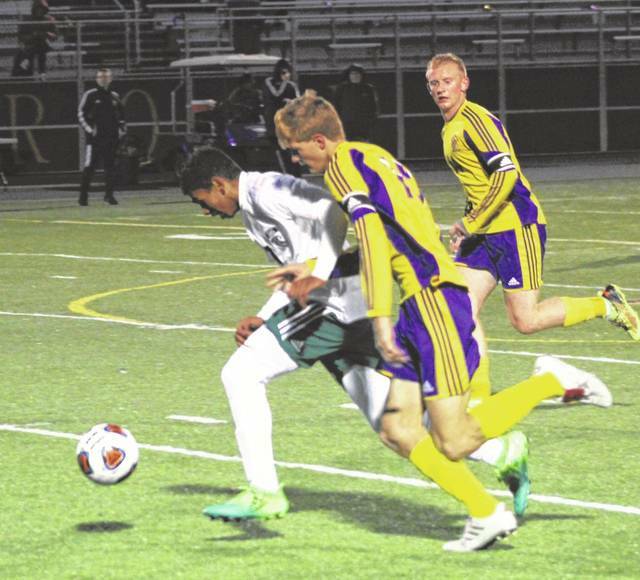 Machado would score three more goals all in the second half to lead Bellbrook to the victory. Despite the fact that Bellbrook scored six times, Greenville sophomore Jacob Maher had an outstanding game in goal with several phenomenal saves that prevented the score from being even higher. He was so impressive even winning coach Bob Parks commented about him. “Jacob has been real solid this year and tonight he made some phenomenal saves,” Coppess said. “He’s a key part back there. Greenville’s season ends with a 2-13-2 record, while Bellbrook (8-5-4) moves onto to face Eaton in the next round on Thursday. “It was a nice way to start the tournament,” Parks said. “First games are always difficult. Tournament nerves I guess. Everybody has them, so it takes a while to settle down, but now that we have a game under us hopefully we can advance through the tournament and have some success.